Published: Jan. 24, 2014 at 11:21 a.m. Updated: Jan. 25, 2014 at 03:31 p.m.
Peyton Manning famously told critics back in December to shove the cold-weather narrative "where the sun don't shine." His play in December helped quiet down the story, but the high-flying Denver Broncos offense will have to prove once again that they can score big points in rough conditions. Temperatures are expected to be below freezing for Super Bowl XLVIII. The Broncos couldn't have asked for a better practice setup Thursday in Denver: It was 10 degrees. "We've practiced in this and had to play in these types of conditions at different points in the year," Manning said, via Newsday. "So any time you can have a similar situation you can simulate during practice which it might be during a game, it always is a good thing." The weather is going to be a storyline all next week, as it should be. It's going to be the coldest Super Bowl in history, and practice conditions during the week are expected to be even worse. In theory, that favors the defensive-minded Seattle Seahawks. "If anything, I'm worrying about them canceling the game. That's the only thing I'm worried about," joked Broncos safety Mike Adams. "Other than that, I'm worrying about playing, that's it. Not the weather." 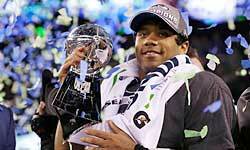 It's good to get this story out of the way nine days in advance of Super Bowl XLVIII. Now we don't have to mention the weather again, right?